The emails exchanged with Antoinette Hilliard of the Durham Public Defender's Office are self-explanatory, whereby their involvement in the cover-up is laid bare, and directives to avoid the consequences of their misdeeds were articulated in three steps. Ms. Hilliard's email (at the bottow) follows a long period of unresponsiveness and reflects feigned inability to help in an obviously rigged arrangement which she is part of. In reality, she is lying in a continued effort to facilitate a kangaroo court-styled conviction by default. This way, the bogus charges that remain will be accorded credibility in the cover-up of the true crimes in this matter -- to wit, the felonies of Durham Judge David Q. LaBarre and his girlfriend, Leah R. Krier. 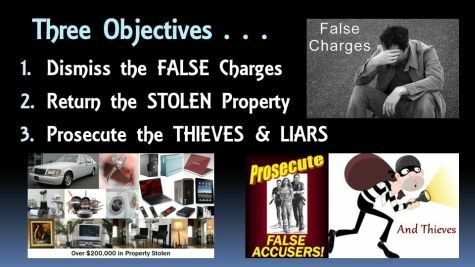 The FALSE convictions are also intended to cover-up the reckless prosecutorial efforts of Durham District Attorney Leon Stanback, and his unethical side-kick, Kelly G. Gauger. In reality, their now desperate actions will serve to only exacerbate the consequences they now face, for as stated in transmittal . . .
Why are you trying to continue this charade? The jig is up. Do you not recognize the gravity of this matter and the downside you personally face in trying to cover up the felonies of a sitting judge (David Q. LaBarre) and a District Attorney (Leon Stanback) whose reckless prosecutorial behavior makes disgraced former Durham DA Mike Nifong look like a choir boy? If you now legitimately cooperate in correcting this bombastic travesty of justice, you will not only avert the eventual consequences, but countless others may thus benefit from your acts of valor. Do NOT underestimate my resolve . . . there are TOO MANY people who are counting on me, and I am NOT going to let down. I have checked to see if a directive from the Judge was signed to remove Attorney Daniel Meier or granting a continuance. At this point, I do not see one for either. Whenever the Judge removes Mr. Meier as your attorney, a new attorney can be assigned if such is ordered by the Judge. Until then, I unfortunately cannot unilaterally remove Mr. Meier. I will keep looking for any signed order though.